S. scabies is one of three streptomyces species that causes common scab symptoms on potatoes and other root crops. 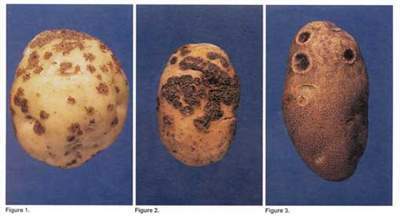 S. scabies is present in soils in all the potato growing regions of the world and also affects other fleshy root crops. Potatoes (Solanum tuberosum) are the main economic host but other fleshy root crops, including beets, radish, rutabaga, turnip, carrot and parsnips, are affected. S. scabies can be isolated from infected potato tissue by first surface sterilizing the tuber with a dilute bleach solution. Tissue should be selected from the edge of the necrotic areas (may be a light yellow or straw color). A small amount of tissue is homogenized with sterile distilled water and the resulting suspension streaked onto water agar. (NPPC (nystatin, polymyxin, penicillium, cycloheximide) water agar, which contains antibiotics, can be used if bacterial or fungal contaminants are present (see Schaad et al, 2001). Check the plates after a few days for a smooth firm mycelium which later develops aerial hyphae. The hyphae will begin to fragment into spores giving the culture a powdery appearance. S. scabies is one of three streptomyces species which can infect potato tubers and can be differentiated by spore color, aerial hyphae form and color, pigment production, and sugar utilization (See Table 1 for more details). Because the current methods of S. scabies identification are laborious and time-consuming, research is under way to develop rapid diagnostic tests based on PCR identification tools. Isolation from soil is difficult but possible using soil dilution plating, however, many contaminants will be present. Adapted from Schaad et al, 2001. 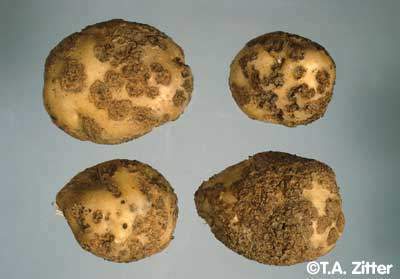 S. scabies causes variable symptoms on the surface of potato tubers including erumpent, russet, and pitted lesions. Erumpent lesions are raised lesions, russet lesions are defined as superficial corky tissue that covers large areas of the tuber surface and pitted lesions are dark colored sunken areas up to � in deep. Scab lesions can occur anywhere on the tuber surface and more than one type of lesion may be present on a single tuber. Scab affects young tubers with the lesions expanding as the tuber matures. There are no above ground symptoms of common scab infection. S. scabies is an unusual bacterium that has a filamentous growth form similar to fungi. 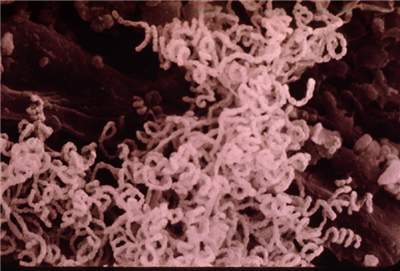 However, S. scabies filaments are much smaller than fungal hyphae � S. scabies filaments are 1 �m or less in diameter. The filaments are vegetative and break off or fragment to form spores. S. scabies survives in the soil as spores in infected tissue and is spread through water, on infected plant material, and in wind-blown soil. S. scabies infects young tissues (like developing tubers) directly and gains access to older tissue through wounds and natural openings. S. scabies also produces a toxin, thaxtomin, which is closely involved in the infection cycle. Once S. scabies has entered the host, it grows both between and through cells and incites multiple cork layer formation, which results in the scabby appearance of the lesions. Davis, J.R., McMaster, G.M., Callihan, R.H., Garner, J.G., and McDole, R.E. 1974. The relationship of irrigation timing and soil treatments to control potato scab. Phytopathology 64(11):1404-1410. Embleton, J., King, R.R., and Lawrence, H.C. 2004. Occurrence of turnip scab Caused by phytotoxin-producing Streptomyces spp. Plant Dis. 88:680. Lehtonen, M.J., Rantala, H., Kreuze, J.F., Bang, H., Kuisma, L., Koski, P, Virtanen, E., Vihlman, K., and Valkonen, J.P.T. 2004. Occurrence and survival of potato scab pathogens (Streptomyces species) on tuber lesions: quick diagnosis based on a PCR-based assay. Plant Path. 53(3):280-287. Levick, D.R., Stephens, C.T., and Lacy, M.L. 1981. 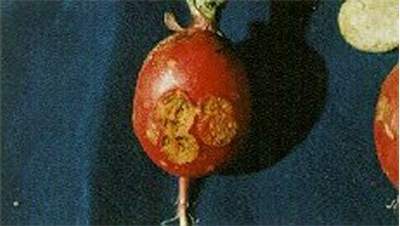 Etiology and control of radish scab. Phytopathology 71(8):889-890. Loria, R., Coombs, J., Yoshida, M., Kers, J., and Bukhalid, R. 2003. A paucity of bacterial root diseases: Streptomyces succeeds where others fail. Physiological and Molecular Plant Pathology 62(2):65-72. Schaad, N.W., Jones, J.B., and Chun, W. 2001. Laboratory guide for identification of plant pathogenic bacteria. APS Press, St. Paul. Third edition, pp: 236-249. Stevenson, W.R., Loria, R., Franc, G.D., and Weingartner, D.P. 2001. Compendium of potato diseases. APS Press, St. Paul. pp: 14-15.